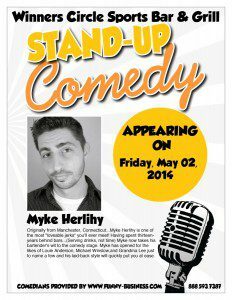 Originally from Manchester, CT. Myke Herlihy is one of the most lovable jerks you’ll ever meet! After spending thirteen years behind bars, serving drinks not time, Myke now takes his bartender’s wit to the stage. Whether he’s discussing his failed relationships, ranting about the trials and tribulations of being an unplanned father, or reminiscing over the insanity that was his childhood, Myke always manages to find the light at the end of the tunnel. His ability to find the funny in any situation has made him a favorite in venues throughout the country. In 2012 and 2013 he was a semi-finalist in the annual “Florida’s Funniest Comedian” competition and In 2013 he was invited to perform at “The World Series of Comedy” in Las Vegas, NV., “The Boston Comedy Festival” in Sommerville, MA., and “The Laugh Your Asheville Off Comedy Festival” in Asheville, NC. He has shared the stage with the likes of Ralphie May, Louie Anderson, Tom Rhodes, Michael Winslow, Pete Lee and Dustin Diamond. Next: Rain Cancelling Some Downtown Polk Events. But Don’t Let That Stop You….